Need a Pool Repair? Blue Science of San Marcos will be there. Most of our pool repair service calls to San Marcos homeowners are $99 for a diagnosis. Pumps: We can install energy efficient pumps (which have become very popular in San Marcos). We can also sometimes optimize a pump's settings to be better paired to your filter and water features. Ozonators: San Marcos pool owners can now go virtually chlorine free with an ozonator. We recommend ozonators over a salt system or choosing a saltwater pool unless you just love the way the saltwater feels and that is worth the salt water system trade-offs to you. We can repair most types of damage to pool decks, surfaces, and walls. To renovate your pool and surfaces, browse our San Marcos remodeling services. Good news! Blue Science also offers leak detection services for San Marcos pools. North of New Braunfels and south of Austin one can find the city of San Marcos. Here there are approximately 46,685 residents living within the 18 sq. miles of the city. There are many activities to enjoy in San Marcos, like the many collegiate athletic games, floating down the San Marcos River, or even shopping at the many outlet stores. 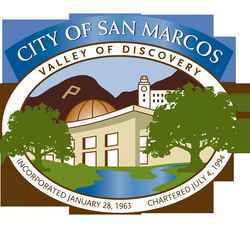 We began servicing San Marcos in January of 2013 and have found that the city provides a great atmosphere with their great economy and wonderful citizens. When providing pool repairs and equipment installations in San Marcos, we use only supplies and parts from top pool companies.